Chez Esme Guest House - Roodepoort Accommodation. Chez Esme is a luxury 4-star Guest House set against Confidence Reef on the West Rand Roodepoort) where gold was found in 1884 by Fred Struben. Traditional elegance is our trademark. Each of our 5 luxury rooms (all en-suite) is spacious and boasts beautiful views, is well appointed with DStv, wake-up radio, heater, ceiling fan, minibar, coffee and tea facilities. E-mail and internet facilities are available for the business person. 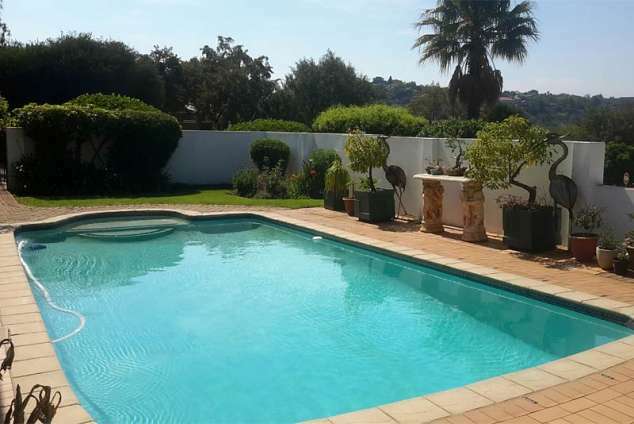 After a day of exploring Gauteng, relax at the pool and enjoy a braai at our well equipped lapa. Warm hospitality awaits you with your hostess, Meena. 21773 page views since 03 Jul, 2007.